Owner Stefano Cesari is the intelligent, intense, innovative producer of Valpolicella Classico, Valpolicella Superiore and Amarone. He once served as President of the Valpolicella Region Grower’s Association, where he dedicated his term to improving the quality of Valpolicella through low yields, improved viticultural practices, careful clone selection and modern winemaking techniques. While he farms the traditional grapes of the Valpolicella Classico D.O.C., his emphasis is on the higher-quality Corvina over Rondinella and Molinara. He produces distinctive wines of very high quality from 15 hectares of estate vineyards near the village of San Floriano in the heart of the Valpolicella Classico zone. 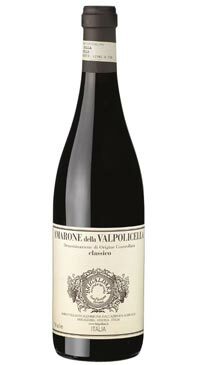 This is a blend of 40% Corvinone, 30% Corvina, 15% Rondinella and 15% other grapes. The grapes are selected and hand picked in the vineyard and placed in crates then left to dry in the fruit drying lofts for several months to raisinate. The wine is left in contact with the grape skins during fermentation and the wine is pumped over twice a day, then racked off the solids and returned halfway through the fermentation process to facilitate colour and flavour extraction. The wine rests for two years in barriques and a third year in larger 25hl barrels. The result is a wine with intense aromas of fruit jam, warm spices, Morello cherries, dried fruit and hints of tobacco and cocoa. It is full bodied, complex, elegant and velvety.